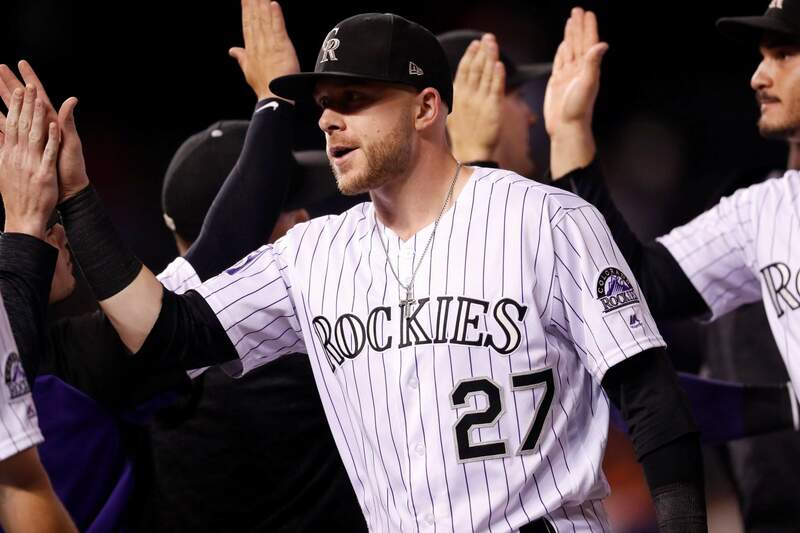 Colorado Rockies shortstop Trevor Story is congratulated by teammates after the team’s game against the San Francisco Giants on Wednesday in Denver. Colorado won 5-3 behind three homers from Story. DENVER – The scorecard in the archives of the Colorado Rockies’ history stands like this: World Series appearances 1, NL West titles 0. Colorado began an off day Thursday with a 1 ½-game divisional lead over the Los Angeles Dodgers and 2 games over the Arizona Diamondbacks. The Rockies (77-62) start a pivotal stretch by hosting the Dodgers for three games starting Friday and then Arizona for four more. The Rockies are a little bit of an anomaly among division-leading team. Consider this: The Rockies are a minus-8 in run differential. For comparison, the front-running Boston Red Sox are plus-223 in the AL East and the defending World Series champion Houston Astros a plus-235 in the AL West. Colorado doesn’t even have the best odds of making the postseason out of its division. According to ESPN, the Rockies have a 48.2 percent chance, while the Dodgers check in at 77.6 percent. The last time Colorado was in sole possession of first at this juncture of the year was 1995. That happened to be the season the team moved into its new digs at Coors Field and was led by players such as Dante Bichette, Larry Walker, Andres Galarraga and Vinny Castilla, who’s currently the team’s special assistant to the general manager. They were leading until Sept. 27 when they lost to a Dodgers team that would go on to win the division by a game. Colorado earned a wild-card spot that season. Over the team’s history, they’ve appeared in the postseason four times – all as a wild-card. The Rockies rode a wave of momentum to the 2007 World Series, before being swept by Boston. Last season, they lost a one-game playoff to the Diamondbacks in their first playoff appearance since ’09. Story and Nolan Arenado are pacing the offense with NL MVP-caliber seasons. Story is hitting .298 with 31 home runs, 95 RBIs and 25 stolen bases. He’s also playing Gold Glove-worthy shortstop. Despite a recent slump, Arenado is batting .297 with 31 home runs and 93 RBIs. He’s going for his sixth straight Gold Glove at third base. On the pitching side, left-hander Kyle Freeland is among the leaders in ERA (2.96), while German Marquez is coming off back-to-back double-digit strikeout performances. The bullpen has been shaky at times this season, but Adam Ottavino has 100 strikeouts to go with a 1.96 ERA and closer Wade Davis leads the NL with 38 saves. After finishing their current 10-game homestand, the Rockies hit the road for nine straight. At 40-32 away from home, they’re one victory away from tying their mark for most wins on the road in a season (2009, ’17).